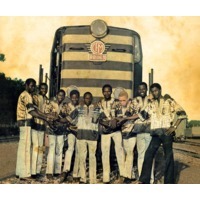 The Rail Band, formed in 1970, is one of the most popular groups in the history of Malian music; it was later known as Super Rail Band, Bamako Rail Band or, most comprehensively and formally, Super Rail Band of the Buffet Hotel de la Gare, Bamako. Its fame was built upon the mid-20th century craze for Latin — especially Cuban — jazz music which came out of Congo in the 1940s. The Rail Band was one of the first West African acts to combine this mature Afro-Latin sound with traditional instruments and styles. In their case, this was built upon the Mande Griot praise singer tradition, along with Bambara and other Malian and Guinean musical traditions. Their distinctive sound came from combining electric guitar and jazz horns with soaring Mandinka and Bamabara lyrical lines, African and western drums, and local instruments such as the kora and the Balafon. At their height of fame in the 1970s, the Rail Band played to sold out venues and even stadia across West Africa, and launched solo careers for many of its members, including the legendary vocalist Salif Keita.